With this book in hand – and willing feet — you can explore the greater Triad region. 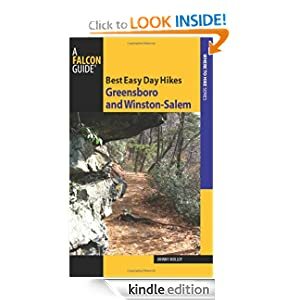 No matter where you go, the trails in this book will enhance your outdoor experience and leave you appreciating the natural splendors of the greater Carolina Piedmont. The cliffs of the ancient peak, today known as Pilot Mountain, offered a southward view that extending into the Triad. The outspread landscape contained the hikes in this book. I mentally recounted all the beauty lying within sight. Nearby, the Yadkin River continued carving a valley as it had done centuries before, past Beans Shoals a few miles distant and Boones Cave in Davidson County. To the east the Sauratown Mountains rose from the Piedmont. They offered views from outcrops on Moore’s Wall and Hanging Rock, and a trip to the geologically fascinating Window Falls. Greensboro’s watershed lakes, north of downtown, held still other hikes that traveled along streams and shoreline. Laurel Bluff Trail climbed a hillside covered in beech trees, eventually leading to an overlook on Lake Townsend. Bur-Mil Park mixed foot trails into Greensboro’s extensive greenway system. The hike at Guilford Courthouse National Military Battlefield explored an American Revolutionary site. Triad hikers can go farther back in time, exploring the 1750s Moravian community at Bethabara Park in Winston-Salem, using greenways and footpaths that also travel by a tree-studded marshland. Other destinations were developed purely with recreation in mind. Salem Lake Park built one of the area’s early greenways. It circles the impoundment and ties into an expanding greenway system. Northeast Park is one of the area’s newest preserves and was laid out with trails in mind, along with ample other facilities. Guilford Mackintosh Park, a watershed lake serving Burlington, was modeled after those in Greensboro, and offers a stellar lakeside trek. Hagen-Stone Park is a time-honored favorite park that also availed camping. A fine trail loops through the many ponds scattered within its bounds. Piedmont Environmental Center, the pride of High Point, delivered two excellent loop hikes situated along the shore of High Point Lake, as well as an environmental education center and the famed large-scale graphic relief map of North Carolina. I scanned farther south, to the Uwharrie Mountains, ancient peaks themselves, softened over millennia and now only extending 1,000 feet high. Yet these mountains, part of the Uwharrie National Forest, held in their grasp the Birkhead Mountains Wilderness, where Triad city residents can enter the back of beyond. Elsewhere in the Uwharries, the Badin Lake Loop gave hikers another opportunity to explore the national forest.